Are you planning to have someone watch your house while you’re away? If so, check out our House Sitter’s Checklist. It’s a chart for you to write down the items your house sitter needs to take care of. As the items are completed, your house sitter can make a check-mark in the box. When you come home, you’ll know exactly what has been completed. A house sitter is a person who comes to your house to take care of things while you’re away. It might be a family member, neighbor or friend. What can a house sitter do? 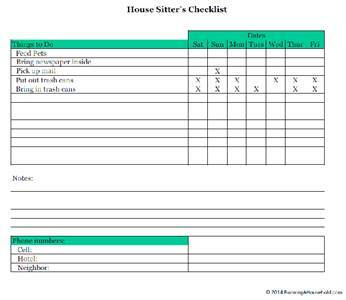 Below, you’ll find a sample of our House Sitter’s checklist. We’ve also included a blank checklist for you to use. 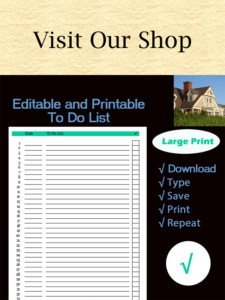 After printing the House Sitter’s Checklist, fill in the days that you will be away. On our sample checklist, you will see we listed a full week: Saturday through Friday. Next, list the tasks that need to be completed every day that you are away. For example, “Feed Pets” will need to be done everyday. Then, list the tasks that need to be completed on certain days. If a task doesn’t need to be done on a certain day, then put an “X” in the box. On our sample checklist, we asked our house sitter to put out the trash cans on Tuesday. All of the other boxes on that line have an “X” to indicate this only needs to be done on Tuesday. Lastly, there’s an area for you to write down important phone numbers. You may want to leave your cell phone number, the phone number of a neighbor, as well as the phone number of your hotel. 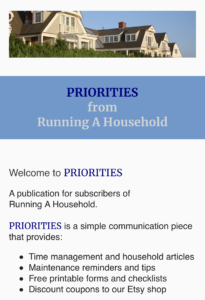 This entry was posted in Organization and tagged checklist for house sitter, house sitter list, house sitters checklist on February 6, 2014 by Running A Household.